What’s up with Cub leaders’ kids? Cub Scout leaders are among the most committed of our adult leadership. They way overspend their “one hour a week” planning and conducting weekly den meetings and field trips, planning pack meeting participation, scheduling meeting rooms, sending out newsletters, wrangling parents to do stuff, recording and submitting advancement, collecting dues and fees, arranging snacks, purchasing craft supplies, and giving up the hope of using their dining room table for dining, for a few years anyway. They are dedicated to seeing their Scouts have fun, advance, and get the most out of the program. Then why is it that their kids don’t seem as likely to cross over to Boy Scouts? 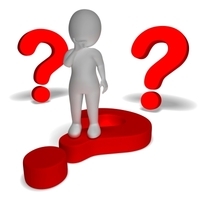 I was reviewing the roster from one of the Cub Scout packs in our town recently, looking for prospects in sixth grade who were still registered from last year’s recharter and about to become expired and separated (the official term for boys whose membership has run out and who have disappeared from Scouting). Knowing many of the adult Cub Scout leaders in town, I recognized several of the names as being those of the sons of pack leaders – some committee members, others den leaders – and got to wondering why they’d go through five years of Cub Scouting and fail to make it across the bridge, where adventure lies ahead. Then it occurred to me – it could be because these leaders do devote a lot of time and effort into Cub Scouting and get burned out on it. They don’t realize the very different role of the adult in the Boy Scout program. 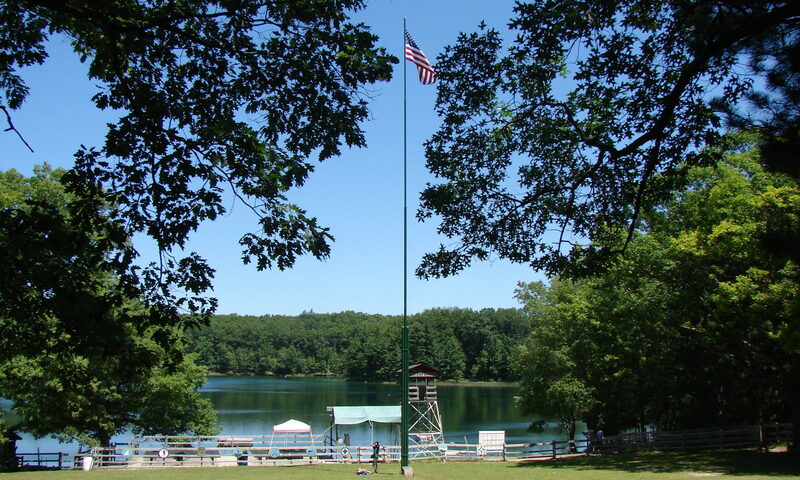 They assume that they’ll be asked to organize hikes and campouts and plan and run troop meetings for much older, and often more rambunctious, boys. And when the leaders’ sons fail to cross over, the chances that the rest of the den will follow are diminished. First, they try to do too many things. An adult who steps forward and volunteers to be a den leader often will also volunteer to do something else besides, such as the pack secretary, treasurer or outings chair. Sometimes the committee chair doubles as advancement coordinator. The Cubmaster may also be functioning as the den leader for his son’s den. Statistics from Scouting’s Journey to Excellence tell us that the average-sized pack has somewhere around 30 Cub Scouts. This means, with siblings, that there are roughly 25-28 families in the average pack. Many packs are even larger than this – I once visited a pack that had over eighty Cub Scouts. If only the minimum number of adults volunteer (a committee chair and two committee members, a Cubmaster, and three den leaders), that leaves as many as twenty families who are not doing anything to help the Pack go. While it’s everyone’s job to encourage their fellow adults to become involved, it ultimately rests on the committee chair to get these parents active and to help them understand that by taking on a small role, they will help another one of their fellow Cub parents keep his or her sanity by lightening the load a bit. Second, most Cub leaders don’t understand just exactly what lies across that bridge, not even for their sons. They only imagine the potential workload that lies ahead without recognizing the benefits of having their son involved in our excellent program of leadership, citizenship, fitness and character development. They don’t understand that in a properly-run troop the boys make the decisions, do the planning and run their program, and we are only there to help and guide them. The weight of responsibility for the success of the troop program is largely off the adults’ shoulders, and the jobs change substantially. So what can we do about it? Although one of the purposes of Cub Scouting is preparing the boys to become Boy Scouts, BSA’s Cub leader training largely focuses only on what’s needed to do their current job now. It doesn’t look down the road at the future. Nor should it – leaders need to have the skills to run their program today. 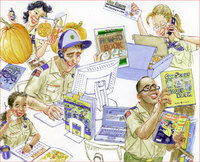 One help would be to suggest that our Webelos den leaders go online and take the Boy Scout Leader Fast Start training. They’ll get a sneak peak at the Boy Scout program and their role in it, and hopefully that will help them explain it to their den families as well. Another thing we can do is take the Webelos parents aside when their dens visit our troop meetings. Explain the changing role of the adult. Invite them to become active as an adult in the troop, and explain that sometimes “active” simply means sitting in an easy chair with a mug of coffee, keeping an eye on the boys from a distance. Hopefully they’ll start to get the idea that Scouting is a continuing adventure for their sons, and a refreshing change for themselves. And make sure the youth leadership is truly in charge and that adults aren’t participating in the troop meeting! Nothing will negate your efforts to convince parents that your troop is boy-led more than seeing adults hanging around the boys during the troop meeting looking like they are running things. Yes, you will have to point out that while youth leadership can be chaotic at times, your Scouts (and eventually, their sons, if they join your troop) are learning to be leaders by leading, and are not merely being led around by adults. With a little effort and forethought, and some reaching out to our Webelos leader friends, we can help improve our transition rates and keep those involved and committed boys – and their parents – in Scouting. I think you are right that cub parents are overwhelmingly involved, at a much higher level than the Boy Scout parents, but I think the kids of leaders are more likely than most to continue on into Boy Scouts. All Anecdotal experience, of course. But almost all of the kids of Cub Leaders that have crossed over to our troop since the troop began 5 years ago have continued to be active, with only one exception. Those boys definately have stayed more active than the non leaders kids, and far more active than those who did not originally come from cub scouts. Most of those recovering den leader parents are also working in the troop as well, albeit generally on the committee level, and with much less time involvement than they had to put in as a Den leader. I would love to see boy scout parents come back and help at the pack level. I think the segmentation of the two programs really hurts us a lot. I have cub Leaders who are EMTs, Certified NRA Rangemasters, and other skills that could come in really handy at the boy scout level. Likewise, I know the troop has some parents who aren’t as critically needed with their own son’s group, and have the experience and skills needed to show scouting to the younger age group. But It’s hard to get someone to volunteer when their son is in a different unit.